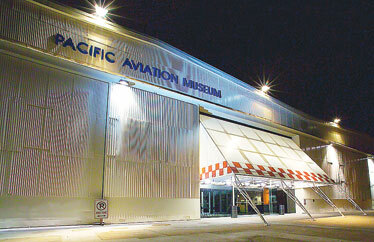 The Pacific Aviation Museum is at Hangar 37 at Ford Island, open from 9 a.m. to 5 p.m. to visitors, and site of a summer keiki program sharing Hawaii's aviation history. One way to learn about aviation and its history is to take to the air with a visit to the original WWII hangars on Ford Island at the Pacific Aviation Museum, Pearl Harbor, where 2008 Educational Summer Programs are geared toward keiki age 5 and up. Children 5 and older can take a 1 1/2-hour tour of the museum during the Keiki Air Cadet program, at $5 per person. Those 7 and older can take the tour that runs 2 1/2 hours, including flight lab experience, at $8 per person. The Education Center's Flight Lab is equipped with individual flight stations that bring to life the aviation history that occurred in Hawaii and the Pacific. Teachers can also inquire about the "Just Plane Fun" School Group Program catering to children 10 and older with group sizes ranging from 10 to 40, at $10 per person for a half-day or $20 per person for a full day. Title One grant funds are available for qualified schools. The Pacific Aviation Museum is open from 9 a.m. to 5 p.m. daily and is accessed by shuttles from Bowfin Park at Pearl Harbor. Call 441-1000 or e-mail education@pacificaviationmuseum.org.